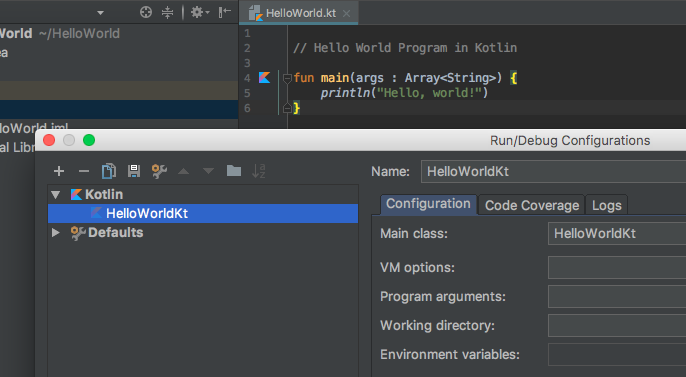 In this article, you will learn to write Hello World program in Kotlin. Before you write the program, make sure your computer can run Kotlin. For that visit: How to Run Kotlin on Your Computer? Let's explore how "Hello, World!" program works in Kotlin. Any line starting with // is a comment in Kotlin (similar to Java). Comments are ignored by the compiler. They are intended for person reading the code to better understand the intent and functionality of the program. To learn more, visit Kotlin comments. This is the main function, which is mandatory in every Kotlin application. The Kotlin compiler starts executing the code from the main function. The function takes array of strings as a parameter and returns Unit. You will learn about functions and parameters in later chapters. The println() function prints the given message inside the quotation marks and newline to the standard output stream. In this program, it prints Hello, World! and new line. As you know, Kotlin is 100% interoperable with Java. Here's an equivalent Java "Hello, World!" program. Unlike Java, it is not mandatory to create a class in every Kotlin program. It's because the Kotlin compiler creates the class for us. If you are using IntelliJ IDEA, go to Run > Edit Configurations to view this class. If you named your Kotlin file HelloWorld.kt, the compiler creates HelloWorldKt class. The println() function calls System.out.println() internally.